Pakistan won by 10 wickets. That's about it from us - hope you've enjoyed a pretty gripping day's cricket (albeit one played at a derisory over-rate). We'll be back bright and early tomorrow. Until then, enjoy the T20, enjoy the Olympics and enjoy the rest of your day. There was a sting in the tail for Pakistan as they lost opener Sami Aslam in the second over - and this time the review system worked in Stuart Broad's favour as he claimed the first wicket, trapping Aslam lbw. It leaves Pakistan ready to start day two on 3-1 - trailing by 325. James Anderson even joined in the fun, hitting a four before Moeen was caught off a top-edged pull as England were bowled out for 328 - leaving Pakistan an awkward 11 minutes to bat. It was also Sohail Khan's fifth wicket. Steven Finn hung around for a while, as Moeen Ali inched towards his century, but fell to leave the last pair together. 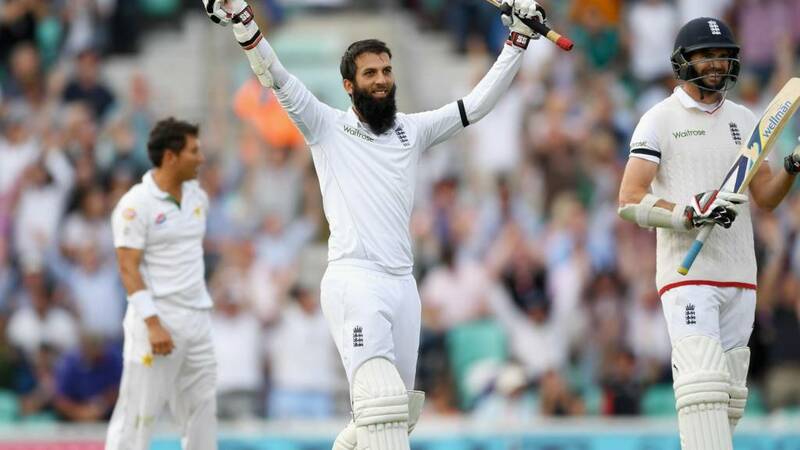 However, Moeen was not to be denied - bringing up his third Test ton in the grand manner with a six over mid-wicket. Remember all the permutations at the start of the day about England's chances of becoming the top Test side? Well, their hopes are slightly boosted by news that play for the third day of the third Test between West Indies and India has been called off because of rain. Coach Anil Kumble's India must win their four-match series 3-0 (they currently lead 1-0), else either England, Pakistan or Australia have a chance to be number one. So a draw in St Lucia will mean India are out of the reckoning. But Sohail Khan then struck twice in an over as Chris Woakes was caught behind, and not even the review system could save Stuart Broad from being given out lbw second ball. Woakes dominated the seventh-wicket stand with Moeen Ali, scoring 45 out of their partnership of 79. But Bairstow's departure brought Chris Woakes to the crease, and the Warwickshire man was soon entertaining the crowd with some fluent boundaries. TMS are going off air - because BBC Radio 5 live sports extra is switching straight to Cardiff for the T20 Blast quarter-final between Glamorgan and Yorkshire. You can listen to that game here. It's going to be sunny tomorrow, we're going to have another good day, but I'll tell you what's been poor - the over-rate. They were eight overs short. In the normal six hours, they only bowled 12 overs an hour, which is like when the West Indies had four quicks. That's pathetic and the administrators should be appalled that they allow it to go on. if they charged the opposition 10 runs an over, and the players £1,000 an over each, they'd get a move on. They need penalties that hurt them. England's Moeen Ali on Sky Sports: "I want to dedicate this hundred to my family because they've supported me. I feel like I'm in good form. When I felt like using my feet I didn't think twice at all. I backed myself to clear the boundary." I think Cook did the right thing by batting. He can't tell that three of his batsmen, including himself, are going to get out to poor shots. I'm not saying 328 is enough, but Pakistan haven't batted well in the last couple of games, and the wrist-spinner Yasir has been ineffective again. In the UAE, you'd think he was bowling hand-grenades at our batsmen. But it's been a different story since Lord's. Sohail Khan got the five wickets, but he looks a bit laboured running in. England's Moeen Ali on Sky Sports: "It was a great day in the end. We'd take 320. It's going well and when I've got good players to bat around, and the tail also all did their job, it makes it easy for me." On being hit on the helmet first ball: "It’s the second time I've been hit on the helmet in the first ball. Mitchell Johnson did it to me last year. But I've worked on my technique. I've stayed calm, and I wasn't fazed by it all." You could tell the crowd were up when Bairstow came in - and when he got out just after tea, Moeen took the game away from Pakistan. He had a lovely range of shots, anybody who saw him bat down the order will think 'wow, what a proper batsman'. If the others had played proper shots, they could have scored 500 or 600. There's nothing in the world as strong as England's middle orders when they've got Stokes, Bairstow and Moeen Ali playing. That's their strength, that and the seam bowling - not the top five. James Hobbs: Anderson stranded just 94 runs from his maiden Test century again. Moeen and Bairstow did well, but Cook, Hales and Root should be very disappointed with the way they batted. They played poor shots - Hales clipped a half-volley to mid-wicket, Root looked like he was playing a 50-over match but nicked one to the keeper. Vince got a really good ball, you can't blame him for that, Ballance got caught at slip and England were in real trouble then. For those of you keeping count, the spectators at The Oval have seen 79.4 overs bowled today, though we did lose 2.2 for the change of innings. So that's eight overs short - if any of you were thinking of hanging around and asking Alex Hales for a refund.